First Line: Summer 1963; Profumo disgraced; Ward dead; The Beatles' Please please me top album; Martin Luther King having his dream; JFK fast approaching the end of his; the Cold War at its chilliest; the Wind of Change blowing ever more strongly through Colonial Africa, with its rising blasts already being felt across the Gate of Tears in British-controlled Aden. Wolf Hadda's life seems to be a fairy tale: he began life as a humble woodcutter's son in a wild and remote area of Cumbria in England, and he's now an extremely successful businessman worth millions and happily married to the woman he fell in love with while in his teens. Hadda knows differently. It took a lot of hard work to get where he is. What he doesn't realize is how quickly it can all be taken away. A knock on the door of his London home one morning eventually sends him to prison, penniless and reviled by one and all. Abandoned by family, friends and business associates, Hadda retreats into silence until seven years later when prison psychiatrist Alva Ozigbo makes a breakthrough. Hadda begins to talk, and with Ozigbo's support, he is paroled and returns to his family home in rural Cumbria. Certain people are made uneasy by his release, and they should be. During a very mysterious period in Hadda's youth, he left his home and was known by his employers as The Woodcutter. 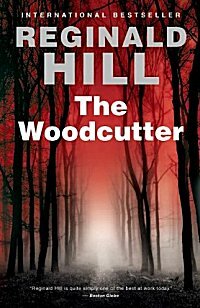 The Woodcutter is back, and he's searching for the truth, and for the identity of those who framed him. To Hadda, revenge would be very sweet indeed. I made the mistake of reading this book in the pool, and it held me spellbound for so long that I nearly turned into a 5 foot 9 inch tall prune. Hill convinced me almost immediately that Hadda had been framed, and it was very skillfully done because Hadda does not wear a halo. I knew that he had a bad temper, rough edges, and had cut a corner here and there in his business, but I also knew that he was not guilty as charged. As Alva Ozigbo, the prison psychiatrist, began working with Hadda, it was amusing. She's young, very talented and intelligent, and knows just what she has to do in order to make Hadda see the error of his ways so he can be cured and released. What she doesn't know is that-- where intelligence is concerned-- Hadda runs rings around her. Once Ozigbo starts to understand what's really going on, her greatest fear is that Hadda will carry his quest for revenge too far. I could go on and on about the unfolding of the complex plot, but it's always my policy to say as little as possible about it. Why read a book review to find out everything that happens in a book? What I will say is that the plot kept me in its clutches from beginning to end, and Wolf Hadda is one of the most complex and fascinating characters I've come across in a long time. If you're looking to be lost in a good book for a considerable length of time, open The Woodcutter and begin to read. My only recommendation is to stay out of the pool while you do. Cathy - Most definitely I want to read this. It's on my TBR anyway, and you've just pushed it up several notches. I could see you as a giant prune! I love books that are so engrossing like that. I am on the lookout for it. I would also like to read a book about a Giant Prune. I knew you would love this book. I couldn't put the darned thing down. Wolf is definitely the greatest character I've encountered in quite a while. When he showered in the ice cold waterfall in winter, I was actually shivering. Someone should write a book about a giant prune, maybe even name her Cathy! Margot-- I'm glad I did! Kathy-- It's not a pretty sight! Myckyee-- I certainly hope you give it a try!